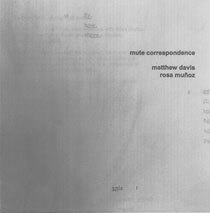 Matthew Davis, trumpet; Rosa Muñoz, dance (tracks 1, 7, 9, 11). Tracks 1, 7, 9, 11 recorded in Salamandra Dance Studios, Barcelona in October 2000; tracks 2 adn 8 were recorded in Villavecchia Studios, Barcelona in September 2000; tracks 3 and 5 were recorded in London in August 2000; track 6 recorded in Cap de Creus, Catalunya in June 2000. Art work (front cover reproduced above) by Matthew Davis.